Editor’s note: this is the second article in this series discussing some potential Google Play Store flaws and what Google could do to improve user experience. Feel free to join the discussion and suggest new topics. You can find a link to part one at the bottom of the page. In-app purchases have been a sore spot for both Google and consumers for a long time. Despite the overwhelming success of in-app purchases, many consumers are unhappy about the unscrupulous methods that some app and game developers use to procure money from their users. Of course, Google has had minor nightmares of their own, culminating in the FTC decision to make Google pay $19 million to parents when their kids made in-app purchases. In-app purchases are a big deal for developers, but more could be done to make it a more pleasant experience for consumers. Please note, this is commentary on how the Google Play Store handles in-app purchases and not how app developers actually use them. That’s a wholly different conversation that we’ll all have together eventually. In-app purchases have made a negative name for themselves in some circles. The “cash cow” philosophy has been a subject of intense ire from many consumers and it’s even been parodied on shows like South Park. Of course, the stats don’t agree with the criticisms, as in-app purchases account for over 95% of sales in the Google Play Store and has allowed developers to make more money than ever before. So what’s the problem? How many in-app purchases are there in total? What kind of in-app purchases are there? Are they consumables (gems), expansions, the pro unlocker, or a subscription? How much money is the developer going to ask you to spend? What exactly are you getting yourself into? The fact is that you cannot answer these questions with the information available on the app description right now unless the developers go through the trouble of explaining it themselves. When you combine that closed-doors approach with a few bad experiences with “cash cow” apps and games, you end up with a consumer base that not only distrusts the whole system, but actively dislikes it. Let’s discuss these issues a little more in depth, shall we? Problem #1: What are we actually paying for? The core problem is that we simply can’t educate ourselves about an app or a game without downloading it. This wouldn’t be too much of a problem if there were only a few apps and games. However, there are currently well over one million apps and games in the Google Play Store. That means the process of finding and downloading each app and game that might look interesting just to see how much it will cost us is counterproductive and even a bit tedious. Without proper information, it severely bottlenecks the experience consumers could (and dare we say: should) be having. Downloading each app and game just to see how much it'll cost is counterproductive. The questions begin to arise. Why doesn’t Google just give us a labeled list of all of the in-app purchases? It’s a good question and even I don’t understand why Google hasn’t done something like this yet. iTunes actually does this very well. If you look at the Clash of Clans iTunes page, you’ll see a list of the popular in-app purchases. 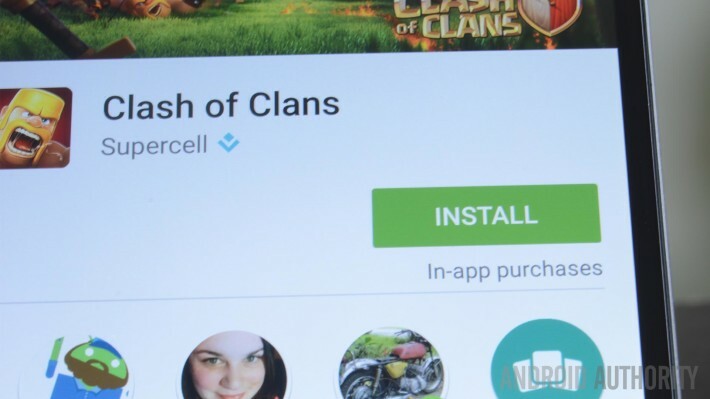 You can clearly see that each in-app purchase revolves around buying a certain denomination of gems and, using a bit of logic, you can deduce that Clash of Clans operates using consumable in-app purchases before you ever download it. It would almost be better if the price range didn't exist at all. Currently, there is a less-than-useful “price range” feature that labels all in-app purchases as “items”. The price range shows the cheapest and most expensive in-app purchase an application has or, if the app only has one, it will show a single price. It would almost be better if the price range didn’t exist at all because it doesn’t provide any useful information. Yes, apps with in-app purchases do, in fact, contain items. Yes, those items cost anywhere from $0.99 to $99.99. These are all things we knew the moment we saw the “offers in-app purchases” label. The long and short of it is simply this: Google does a bad job at showing what these applications have to offer and what few attempts they’ve made to help feel halfhearted and rushed. Subscription prices don’t appear in the “price range” portion of the Google Play Store. Don’t believe me? Look at Spotify’s app. It shows that there are in-app purchases, but no price is given. In fact, there’s isn’t so much as a dollar symbol anywhere on the page. There is something wrong with that. Apps and games that require a subscription do not have to use Google’s in-house system to process payments. Spotify, most VPN apps, and most antivirus apps have accounts that you can create and manage independently from Google. That makes them almost impossible to police on Google Play. A few apps, such as Google Play Music, have a subscription service but there’s no mention of it anywhere. Again, if you don’t believe me, look for yourself. There is no price, no dollar sign, no in-app purchase label, or anything to indicate a cost. Spotify does a little better because it at least gets labeled for having in-app purchases. Humorously enough, Norton Security has the label and the subscription price listed in the price range section of their Google Play page. It appears as though subscriptions live in a reality all on their own. On top of being wildly inconsistent, they appear to be able to skirt the rules other apps have to play by. How does it get fixed? Show us all of the in-app purchases – It’s really as simple as that. Put all of them there and show us what they are. Google Play uses a modular UI and I don’t think anyone would be bummed out if they added a module that showed us the in-app purchases in their entirety, including cost and name. Bonus points if they tell us what kind of in-app purchase it is (consumables, pro versions, expansions, subscriptions, etc). If Google cannot grab this information using their APIs, give developers a box in the publisher dashboard where they can input the prices themselves. Create a standard for subscription services to follow – There currently is no standard for subscription services. Some show prices, others do not. Some are labeled as offering in-app purchases, others are not. Google needs to figure out a standard and begin to hold everyone (including itself) to it. The box in the publisher dashboard idea would work well here as well, especially for developers who don’t use Google services to charge for subscriptions. Create a bottom line requirement for labeling apps – There seems to be no real standard for what counts as “having in-app purchases” and there really needs to be. Amazon Shopping and Google Play Music both allow you to spend money in the app, but don’t carry the IAP label. Spotify does have the label but doesn’t show a price. Grand Theft Auto titles are labeled as having in-app purchases but they actually don’t have any at all. It’s maddeningly inconsistent. In-app purchase labels are maddeningly inconsistent. Allow us to refine our searches for certain types of in-app purchases – This one is a bit complicated. A majority of people who feel disdain for IAPs really only dislike certain types of IAPs such as consumables. If consumers can search for apps and games without those specific kinds of in-app purchases (or no in-app purchases at all), they will be able to find more apps that are suited to their liking and that will ultimately improve their experience. Give apps with in-app purchases their own top charts – This is the totally crazy, shot in the dark suggestion with a lot of potentially positive repercussions. With the apps and games with IAPs in their own category, it helps level the playing field for the standard free and free-paid paradigms without excluding IAPs entirely. This cleaner, more organized layout would result in people finding popular free apps and games and popular paid apps and games with no in-app purchases far more easily. Listen folks, in-app purchases are a good thing. Revenue to developers has increased by leaps and bounds since its inception and they really are making more money now than ever before. That has translated to more content and higher quality content. There is no arguing that fact. Back in 2010, we had 700,000 apps and the best of the best were Flickster, Angry Birds, and Skype didn’t even allow for video calls on mobile yet. Today we have more than double what we had in 2010 and they include massive, gorgeous games and innovative, beautifully designed apps. In 2010, Google Play (formerly the Android Market) made just over $100 million in total revenue. In 2013, after the first full year of in-app purchases, Google Play made an estimated $1.3 billion. It has only gone up since then. Even if you’re against the practice ethically, no one can argue with the results. IAPs are why most developers make money on Android. IAPs are why most developers make money on Android. However, I’m not so stuck in my ways that I can’t admit that there are a few bad apples (proportionately speaking) that make the whole bunch look bad. With the suggested improvements, the transparency will allow consumers to make better, more informed decisions about what apps they want to download. There is even a small, outside chance that “cash grab” developers may use the pressure of full transparency to tone down their aggressive strategies and try to compete by simplifying their pay structure and building better games. Nothing gets the ball rolling like transparency. By giving consumers more control and information with the transparency, improved charts, and refined searches, a lot of the negativity could potentially subside as frustrated users will enjoy a new-found proliferation of apps and games that they actually want instead of being forced to browse through stuff they do not. Who knows, one day maybe being labeled as having in-app purchases won’t be such a bad thing but it’s definitely not something that is just going to happen organically. As always, we’d love to hear your thoughts on the matter in the comments!